The first image is Keif Llama, a 1980s comic book character created by Matt Howarth. She's a xeno-tech, which means she has an ability for understanding alien ways of thinking. 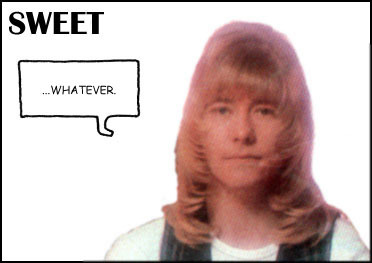 The other person is an anonymous member of the 1970s band Sweet. Remember these folks? They brought us "Ballroom Blitz". Check it out: this guy's got an expression as enigmatic as the Mona Lisa. The similarity is truly striking. No, I don't think Keif was modeled on this guy; Matt's more into Can, Skinny Puppy, and Foetus than Sweet.